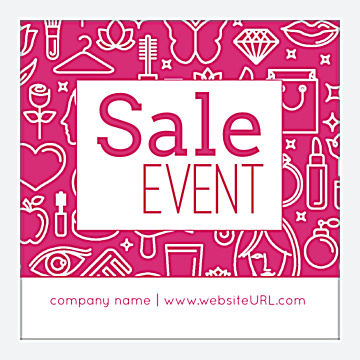 Delight customers with our Playful Sale sticker design template, ideal for boutiques, beauty supply stores, women’s accessory shops, direct sales vendors, and more! Available in five different bright color schemes, two shapes, and three distinct edge finishes, Playful Sale is a fun sticker design sure to charm your customers. Playful Sale features a brightly colored background full of fun images such as flowers, perfume bottles, lips, hearts, butterflies, jewels, and more. In the center of the background is a white field with the words SALE EVENT. Below the background is a white bar with space for your company name and website URL. All text can be customized to fit your brand and message. Personalize Playful Sale fast and easy with our online sticker maker today! Our online design tool helps you design outstanding stickers in no time! The point-and-click interface walks you through the entire design process so you can pick your color scheme, add your text and print custom stickers to promote your brand. Once you’ve created your custom sticker design, you can print a free PDF to share with friends and team members before you print. Superior paper stock and high-quality printing set PsPrint apart when it comes to custom stickers. Our custom stickers are printed on cutting-edge printing presses in our state-of-the-art printing facilities, located nationwide for quick shipping. Add in our customer satisfaction guarantee and you can trust that you’ve found the best printing partner for your custom stickers! Want your flyers to stand out? Add a custom sticker. Handing out samples at a special event? Add a sticker label. Add extra shine to your stickers with a foil stamp. And if you need assistance, call on our custom printing team to make your concept a reality!